The Jacobins were members of an influential political club during the French Revolution. They were radical revolutionaries who plotted the downfall of the king and the rise of the French Republic. They are often associated with a period of violence during the French Revolution called "the Terror." The official name of the political club was the Society of Friends of the Constitution. The club became known by the nickname the "Jacobin Club" after the Jacobin monastery where the club met in Paris. At the start of the French Revolution in 1789, the Jacobins were a fairly small club. The members were like-minded deputies of the National Assembly. However, as the French Revolution progressed, the club grew rapidly. At the height of their power, there were thousands of Jacobin clubs throughout France and around 500,000 members. One of the most powerful members of the Jacobins was Maximilien Robespierre. Robespierre used the influence of the Jacobins to rise in the new revolutionary government of France. At one point, he was the most powerful man in France. In 1793, the new French government was facing internal civil war and was being attacked by foreign countries. The Jacobins were afraid that the revolution was going to fail. Behind the leadership of Robespierre, the Jacobins instituted a state of "Terror." Under this new rule of law, they would arrest, and often execute, anyone suspected of treason. Thousands of people were executed and hundreds of thousands were arrested. Eventually, the people realized that the state of terror could not continue. They overthrew Robespierre and had him executed. The Jacobin Club was banned and many of its leaders were executed or jailed. Mountain - The Mountain group, also called the Montagnards, got their name because they sat along the top benches of the Assembly. They were the most radical faction of the Jacobins and were led by Robespierre. They opposed the Girondists and eventually gained control of the club. Girondists - The Girondists were less-radical than the Mountain and eventually the two groups came into conflict. 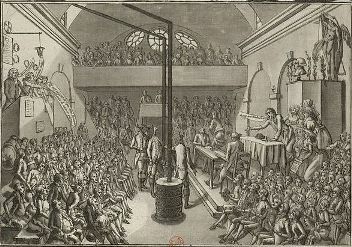 Many Girondists were executed at the start of the Terror for opposing Robespierre. While the Jacobins were the most influential political club during the French Revolution, they weren't the only club. One of these clubs was the Cordeliers. The Cordeliers were led by Georges Danton and played a major role in the Storming of the Bastille. Other clubs included the Pantheon Club, the Feuillants Club, and the Society of 1789. The famous radical journalist Jean-Paul Marat was a Jacobin. He was assassinated by a Girondist sympathizer named Charlotte Corday while he was taking a bath. The Jacobin motto was "Live free or die." They set up a new state religion and a new calendar. The term "Jacobin" is still used in Britain and France to describe certain branches of politics.